Today is going to be fun: we’re talking about bags + how I pair them with different outfits. I’m always kind of amazed at how a bag can impact an outfit. While bags aren’t included in my capsule wardrobe count, I still like to keep things decently minimal. To me that means four. I have four bags on rotation, and each one serves a different purpose + compliments certain types of outfits. Got it? Yay! Let’s go — here’s how I pair my bags + outfits. A super casual bag paired best with pieces that are between 1-6 on the dressy scale. This bag adds playfulness. While this bag is super casual, I like to pair it with dressier pieces to help the outfit get to a place where it’s not taking itself too seriously. Think about it — a backpack feels fun + a bit childlike. Like this outfit below. This snakeskin maxi is pretty fancy. But if paired with more casual accessories, it becomes playful and relaxed. Which, in my opinion, is exactly what it needs so it doesn’t feel too perfect. Dressy dress + casual bag = the perfect outfit for a casual patio dinner. One last quick thought about this bag: I think this look is about as fancy as this backpack can go — if it was paired with something dressier, I think it would just start to look out of place. Since this bag is a casual bag by nature, though, it works perfectly with super casual pieces. Like this outfit, below. All casual + all good. A perfectly dressy + casual bag paired best with pieces that are between 1-10 on the dressy scale. This bag does it all. This is my most versatile bag, by far. If I had to live with one bag for the rest of my life, this would be it. I can throw it on with anything and it just hums along in the background, looking awesome, yet never demanding attention. No matter if I’m wearing yoga pants, jeans, or a cocktail dress. It always works. Here’s how I’d wear it with a fancier dress. Now, I get that this isn’t a cocktail dress, but on the rare occasion that I actually do put on a cocktail dress, this is how I pair this bag with it — holding it all clutch like. And here it is with another dressed up look. See what I mean about humming along in the background? It’s there and it’s beautiful, but it’s not stealing the attention. Surprisingly, I don’t have any pictures of this little black bag paired with a super casual outfit. But it happens all the time in real life. A super casual bag paired best with pieces that are between 1-4 on the dressy scale. This bag is super functional. Super casual. This bag actually doesn’t work both ways — it only goes casual. But it’s one gorgeous casual bag. And while it doesn’t add to the level of outfit dressiness, it definitely adds to the level of outfit classiness. Y’know what I mean? It’s ideal for traveling because of it’s size and structure. It can be my carry on + my day purse on the trip. This is a typical outfit I might wear when traveling. 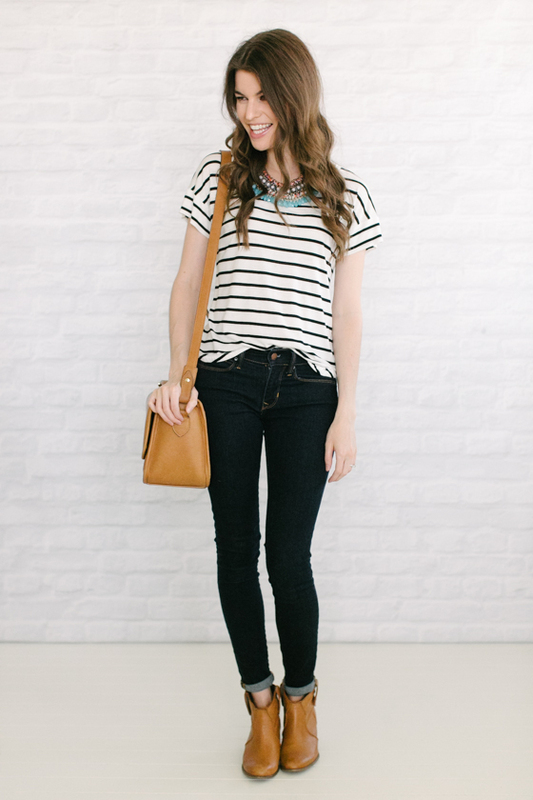 Boots + jeans + tee + fun necklace + ONA bag. And here it is again with another casual outfit, looking totally at home. A dressy bag paired best with pieces that are between 3-4 on the dressy scale. This bag adds interest. You might be a little surprised, but I pretty much only pair this bag with casual pieces — but it’s because it elevates them so beautifully. Like these two outfits, below. The elements are super casual, but the cheetah clutch adds the perfect amount of interest to these kinda boring outfits. I do … and I want to let you in on a little secret. My ONA bag + Hobo bag + Madewell clutch were gifts given to me over the past few years. My family is a little different — everyone asks for specific gifts on holidays. 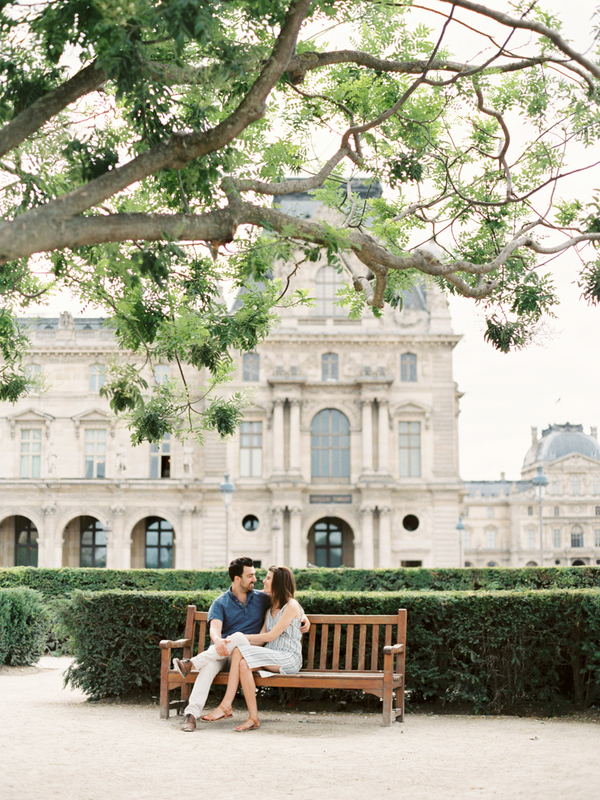 We don’t like leaving it up to chance, we want to get that person something they really want. So when my birthday rolls around, I’ll ask for gift cards to help me get something I couldn’t shell out for on my own — like one of these bags. Do you have any tips on bag pairing? Share away in the comments section! Adorable bags. I love how they can really make an outfit. Oh, but just so you know, the one for the Cheetah print bag isn’t a link to a similar bag. Love your booties you wore with your skinnies and striped shirt. Who makes them? Thanks! I am so in love with your blog! It has made me rethink my own outfits, wardrobe, and pieces in my closet. It’s helpful that you have similar (but not identical) style :) but i think your tips are generally universal. 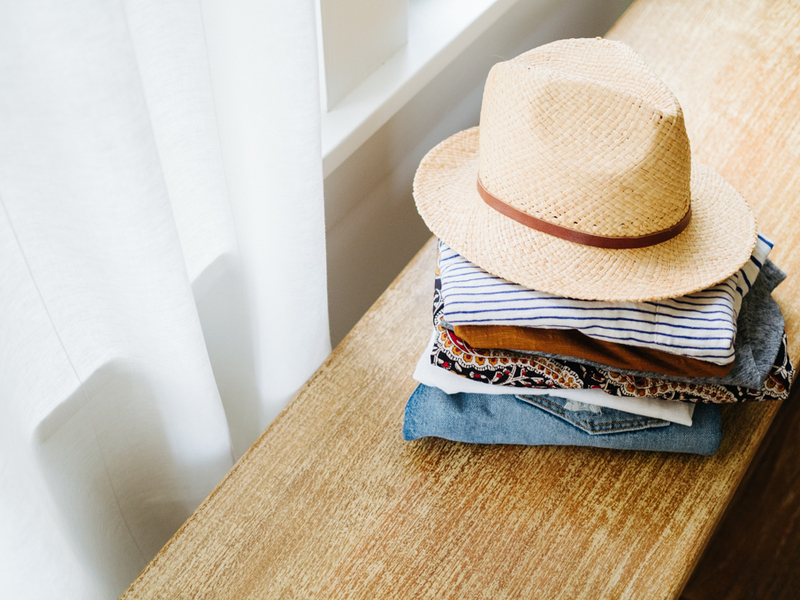 I’m not sure if I’m ready to make the leap to capsule collections yet, but I’m definitely realizing how to maximize my closet and its contents, and it’s already helped me to shop smarter. Your posts are the ones I look forward to most in my feedly! I love your blog! 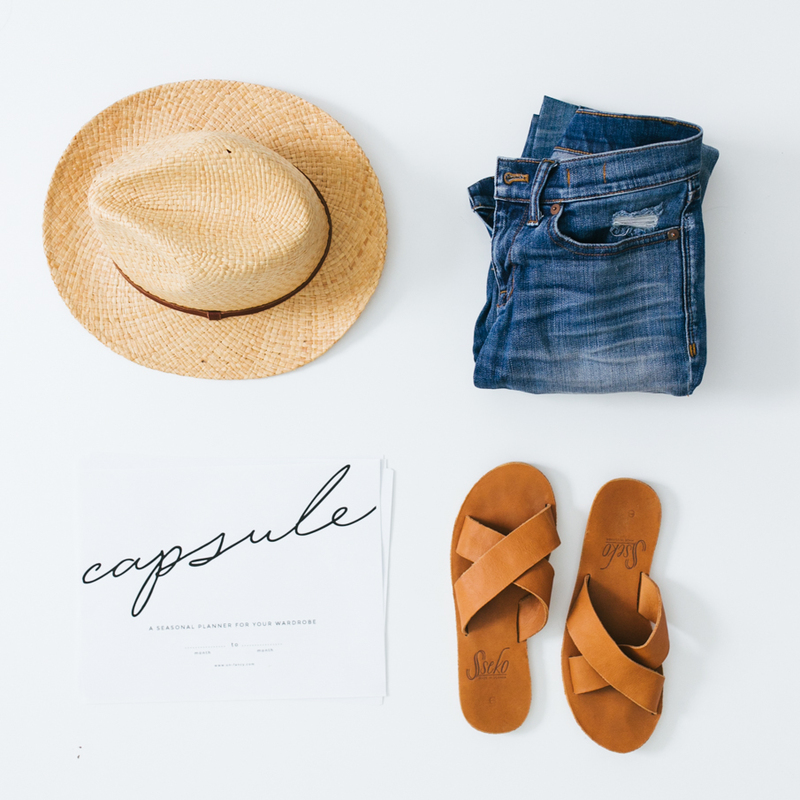 I’m trying to create my own capsule wardrobe since May/June and your thoughts are really helpful. My boyfriend and his family do the same thing for gifts! It’s taken me a while to get to used to it, but I definitely like it, gets rid of the mystery and stress of shopping. 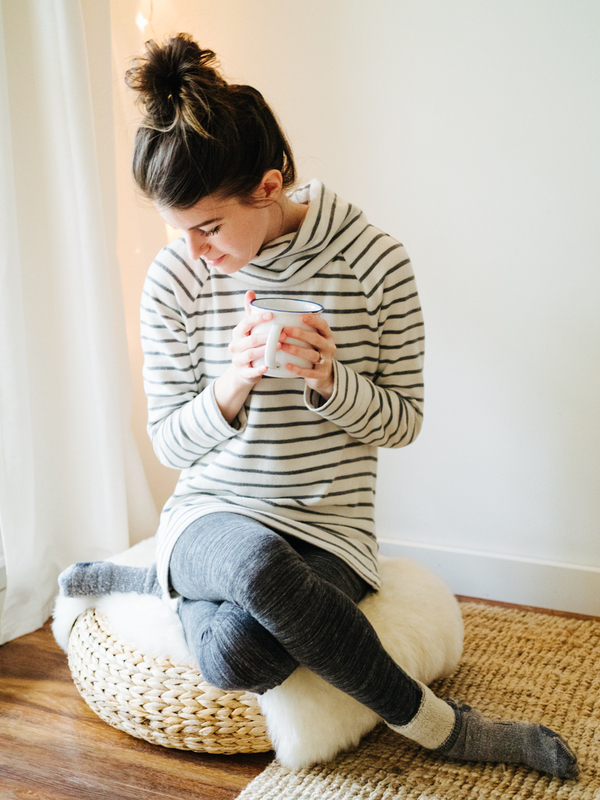 Going through your blog posts made me realize how much random clothing I never wear, and what I really only wear in the fall/winter vs spring/summer. Time to get cracking on my closet! I love this post. I find I either rotate my bags way to much or just get stuck in a slump and use the same one everyday. 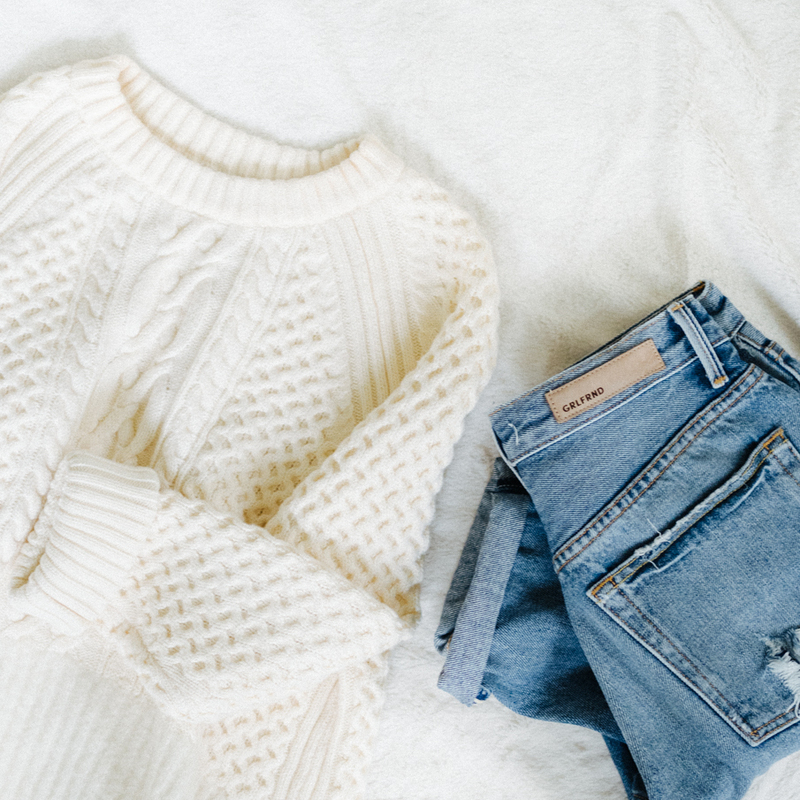 Your style is perfect and I love how you’ve carefully thought out each of your items. Very inspiring. I’m pleasantly surprised to see that you’re getting by on four bags, for a non-fashionista like me that seems surprisingly doable! Especially once I stop spending money on clothes I don’t need, I can start investing in bags! Love this post! What about a tote bag? Do you ever miss having one?